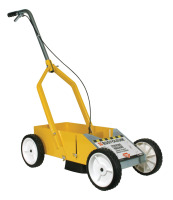 Hitt Marking Devices offers a range of line striping machines, suitable for the DIY parking lot owner all the way up to the line striping professional. Whether you need an aerosol paint stripper for small painting jobs or something more robust we have it all. For striping sport athletic fields, large parking lots, or even airports we are sure to have something that will meet your line painting needs. Due to sizes and weights of these products, and the fluctuating shipping costs we DO NOT have our shopping cart figured with shipping charges at this time. Please let us know if you need a freight quotation and we will be happy to provide you with that information. Eliminate the annoyance of paint or chalk on your fingers!